I got this idea from an earlier thread. Using plastic type 5 (PP) cups for agar. I especially liked the idea of using the bigs ones then chopping the colonized agar in situ then adding spawn or substrate over the agar and mixing. But I picked up a few cups and got an idea that I'll test later this weekend. How about stacking your cups in the autoclave perhaps with agar already in place. Use some sort of shim to provide for an air channel and to add extra space between the cups. With these 3" dia cups I note that they stack at just about 1 cm apart at the bottom. Perhaps a little close if there is agar in place. But with some sore of shim, maybe toothpicks, they can come up another cm. I have tried autoclaving petri plates with agar in place and generally prefer to pour the hot agar into sterilized plates but maybe I'll try both ways with these cups. There might be a bit of water run down from the sides of these tall 'plates'. I have the tops as well and they seal pretty well. I have an idea of how one could pull them apart after sterilizing and pour each one while replacing the one above on the stack, keeping things sterile. 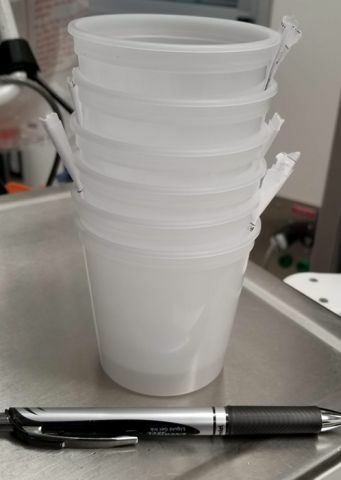 Then let cool and separate and place sterile lids or, I suppose pull apart, noc each one and replace the one above in sterile fashion if you are doing multiples of the same thing like multiplying an iso. I'll play with a couple of sizes and report on how it works out.